Farmers markets in Maine are abundant, selling everything from farm fresh eggs to handcrafted jellies and jams to colorful and healthy vegetables. 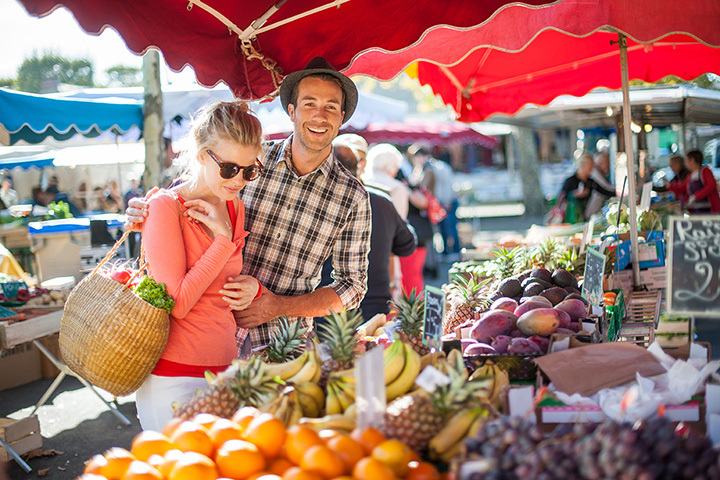 While they’re more common during nicer weather, you can find a market in Maine year-round. From Portland to Houlton, there is a seasonal farmers market in most of Maine’s largest cities and towns. Here are our 10 favorites. The Portland Farmers Market runs in Deering Oaks Park on Saturday mornings and Wednesdays in Monument Square from April to November. You’ll find a large selection of fruits, vegetables, meats, and handcrafted goods from a variety of local farmers from across southern Maine. Opened every Saturday from mid-May through the end of October, the Augusta Farmers Market at Turnpike Mall is the oldest farmers market in Maine’s capital. Vendors offer a variety of vegetables, fruit, meat, baked goods, and even homemade dog treats. Opened every Wednesday year-round in the afternoon, the Ohio Street Farmers Market offers a wide variety of vegetables, apples, meat, eggs, and locally produced honey and maple syrup. The farmers market often has vendors selling crafts and personal care products made from gluten-free and vegan ingredients. The Brunswick Farmers Market is one of the oldest farmers market in the state of Maine. Farmers sells their goods along the downtown Brunswick Mall and Gazebo park every Tuesday and Friday from May to November. It’s the perfect place to grab your groceries and support local farmers. Founded in 1974, the long running Camden Farmers Market is located behind the Know Mill. Over 25 farmers come every Saturday and Wednesday to sells their produce and goods from May through November. Eastport might be Maine’s most eastern town, but its farmers market is similar to Maine’s more western cities. Held Saturdays from mid-June to mid-October, this small farmers market offers a variety of fresh, local produce, herbs & spices, eggs, and seasonal fruits and berries. The Moosehead Farmers Market is the highlight of Greenville every Friday from May through October. The many local vendors offer up fresh produce, milk, maple syrup, meats, jams, and even homemade soaps and yarn. Founded in 2009, this open-air downtown market features locally grown and made items ranging from vegetables, meats, cheeses, baked goods, and crafts. The Houlton Community Market runs every Saturday morning from Memorial Day weekend through October. The Northeast Harbor Farmers Market runs seasonal from late June through August on Thursdays. Local Downeast farmers sell their locally grown and produced flowers, fresh fruit and berries, preserves, vegetables, and delicious baked goods. Don’t forget to purchase your seafood here, too! The Union Farmers Market is one of Maine’s most diverse farmers market. Opened from May through October, this market is located on the front lawn of the historical Union Common. Vendors sell “homegrown and handmade” products for the whole family. View more Maine Farmers Markets.